A man who admitted assaulting a five-week old baby boy, leaving him blind and brain damaged, has been jailed for seven-and-a-half years. 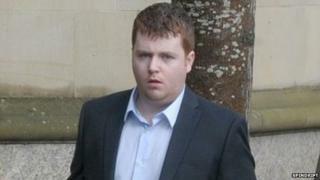 Stephen Sweeney, 27, is believed to have shaken and squeezed the infant at Hunters Quay caravan park in Dunoon, Argyll and Bute, on 3 September 2013. When later asked by a relative of the child if he "had lost it", Sweeney replied: "I don't know, I was tired." The High Court in Glasgow heard the child has cerebral palsy and epilepsy. Judge John Morris QC described the case as a "truly tragic" and said the boy's life had been "devastated" by what happened. He told Sweeney: "Be under no illusions, you pled guilty to a deliberate attack. You have accepted responsibility for severely damaging an innocent young child. "No sentence can adequately reflect what you done." The judge said the jail term would have been 10 years, but for the guilty plea. Several of Sweeney's family and friends were in tears as he was led away to start his sentence. After the hearing, the boy's mother described the sentence as "just and fair". In a statement, describing her son's ordeal, she added: "This is the kind of nightmare that you read about in the news and never believe that it could happen to your own child." At a previous hearing, the court heard that Sweeney, from Blantyre, South Lanarkshire, had joined the child and his mother on a short break at the caravan park. In the early hours of 3 September 2013, the boy awoke for his regular feed. Sweeney decided to take the child from his cot to deal with him while the mother stayed in the bedroom where she could see them both. The mother fell asleep but awoke to hear Sweeney shouting for help. He had the child on his knee while claiming: "He's not right." The mother noticed the boy appeared tired, pale and drowsy. His eyes were half shut and he was taking short breaths. His leg was also shaking and he appeared to be floppy. They took the child to the local hospital in Dunoon where medics diagnosed a viral infection and allowed them to leave. When the child refused to feed and looked to be in pain he was later taken to the Royal Hospital for Sick Children at Yorkhill in Glasgow. Doctors found he had haemorrhages and bruising and signs of rib fractures. The child's condition deteriorated and he eventually required resuscitation and ventilation. The court heard the boy later improved and was able to move but medics suspected he had been the victim of "abusive head trauma". Later that month, hospital staff told Sweeney and the child's mother his injuries were "non accidental". After the meeting, the mother confronted Sweeney who claimed he had "done something" while trying to "shush" the child. He then blurted out: "Oh my god, I've done this. I'm responsible for this." The next day, Sweeney told his own mother that he had been bouncing the child on his knee and that the baby's head had been moving backwards and forwards. Another relative of the baby then asked Sweeney if he had "lost it". Sweeney told her: "I don't know - I was tired." He was detained by police on 20 September 2013 and claimed what happened was "an accident". Sweeney said he had held the boy tightly that morning as he moved him up and down as well as backwards and forwards. Leading paediatrician Dr Helen Hammond was asked to provide expert opinion on the case. She told the court the child's injuries were consistent with the baby being shaken and gripped. She added that the way the boy appeared at hospital could be explained by Sweeney's claims he "bounced" the boy on his knee while not supporting his head. But, the force would have to be "excessive" to cause the brain injuries. The court heard the prognosis for the boy was "poor". He was registered blind, had cerebral palsy and suffered from epilepsy. Sweeney pleaded guilty to assaulting the child to the danger of his life.